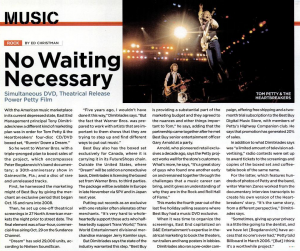 With the American music marketplace in its current depressed state, East End Management principal Tony Dimitriades knew a different kind of marketing plan was in order for Tom Petty & the Heartbreakers' four-disc CD/DVD boxed set, "Runnin' Down a Dream." So he went to Warner Bros. with a triple-pronged plan to boost sales of the project, which encompasses Peter Bogdanovich's band documentary; a 30th-anniversary show in Gainesville, Fla.; and a disc of rare and unreleased tracks. First, he harnessed the marketing might of Best Buy by giving the merchant an exclusive period that began Oct. 16 and runs into 2008. Then, he set up one-off theatrical screenings in 27 North American markets the night prior to street date. The final element was a four-hour, commercial-free airing Oct. 29 on the Sundance Channel. "Dream" has sold 29,000 units, according to Nielson SoundScan. "Five years ago, I wouldn't have done it this way," Dimitriades says. "But the fact that Warner Bros. was prepared to work with artists that are important to them shows that they are trying to step up and find different ways to put out music." Best Buy also has the boxed set exclusively for Canada, where it is carrying it in its FutureShops chain. Outside the United States, where "Dream" will be sold on a nonexclusive basis, Dimitirades is licensing the boxed set from Warner Bros. to third parties. The package will be available in Europe in late November via SPV and in Japan next year. Putting out a records an an exclusive with one retailer often alienates other merchants. "It's very hard to whole-heartedly support those acts who half-heartedly support Trans World," Trans World Entertainment divisional merchandise manager Jerry Kamiler says. But Dimitirades says the state of the industry warranted this step. "Best Buy is providing a substantial part of the marketing budget and they agreed to the nuances and other things important to Tom," he says, adding that the partnership came together after he met Best Buy senior entertainment officer Gary Arnold at a party. Arnold, who pioneered retail exclusives a decade ago, says the Petty project works well for the store's customers. What's more, he says, "It's a great story of guys who found one another early on and remained together through the challenges that a music career can bring, and it gives an understanding of why they are in the Rock and Roll Hall of Fame." This marks the fourth year out of the last five holiday selling seasons where Best Buy had a music DVD exclusive. When it was time to organize the screenings, East End capitalized on D&E Entertainment's expertise in theatrical marketing to book the theaters, run trailers and hang posters in lobbies. Dimitriades also ran a pre-order campaign, offering free shipping and a two-month trial subscription to the Best Buy Digital Music Store, with members of Petty's Highway Companion club. He says that promotion has generated 20% of sales. In addition to what Dimitriades says was "a limited amount of television advertising," radio contests were set up to award tickets to the screenings and copies of the boxed set and coffee-table book of the same name. 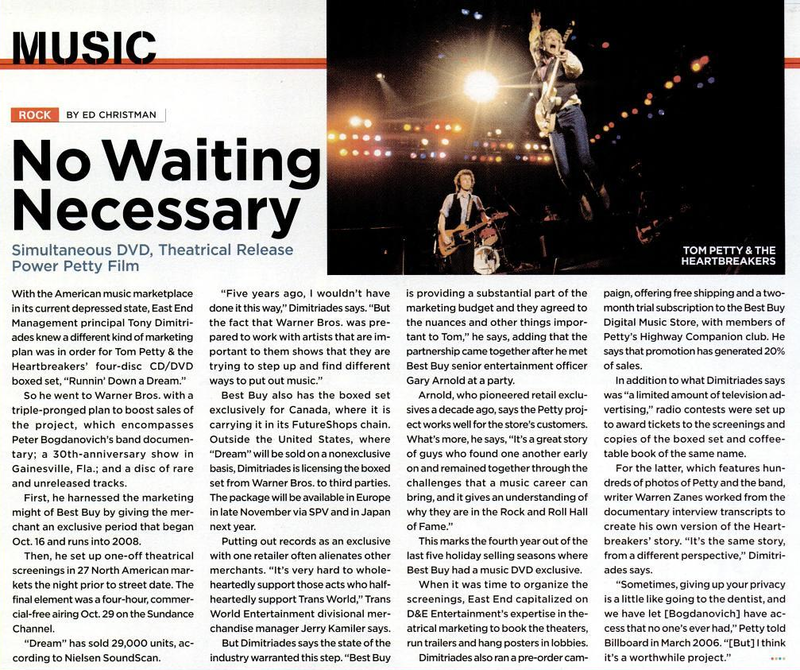 For the latter, which features hundreds of photos of Petty and the band, writer Warren Zanes worked from the documentary interview transcripts to create his own version of the Heartbreakers' story. "It's the same story, from a different perspective," Dimitriades says. "Sometimes, giving up your privacy is a little like going to the dentist, and we have let [Bogdanovich] have access that no one's ever had," Petty told Billboard in March 2006. "[But] I think it's a worthwhile project."